Department of Primary Industries (2005). Pinnace Channel Aquaculture Fisheries Reserve Management Plan. Fisheries Victoria Management Report Series No. 31. The purpose of the Pinnace Channel Aquaculture Fisheries Reserve Management Plan (hereafter also referred to as 'the Plan') is to specify the policies and strategies for managing activity within the Pinnace Channel Aquaculture Fisheries Reserve (PCAFR). The Plan has been prepared under the requirements of the Fisheries Act 1995 (the Fisheries Act) and has been developed in accordance with Ministerial guidelines. The Plan prescribes management arrangements for the PCAFR within a framework of Ecologically Sustainable Development (ESD). The PCAFR is a greenfield site for marine aquaculture that has the potential to support significant expansion of the existing marine aquaculture sectors within Port Phillip Bay (PPB), in particular blue mussels and other bivalve shellfish. The PCAFR consists of two 500 ha blocks located on either side of the Pinnace Channel where it flows northwards from the Great Sands area in southern PPB. The PCAFR was declared as a fisheries reserve under the provisions of the Fisheries Act on 6 March 2003. The scope of the Plan is limited to the PCAFR and its immediate environs. The Plan is also constrained by the provisions of the Fisheries Act; the Victorian Government response to the recommendations of the Environment Conservation Council (ECC) in the final report of their Marine Coastal and Estuarine Investigation (2000); the Ministerial guidelines issued in respect of the preparation of the Plan; and other legislation and policy. clear, transparent and cost-effective management. The Plan prescribes a range of ecological, economic, social and governance objectives and strategies that reflect the goals of the Plan. To achieve these objectives, the Plan prescribes comprehensive performance indicators, reference points and management triggers. a requirement that holders of Crown leases provide a bond or bank guarantee for the removal of aquaculture equipment. 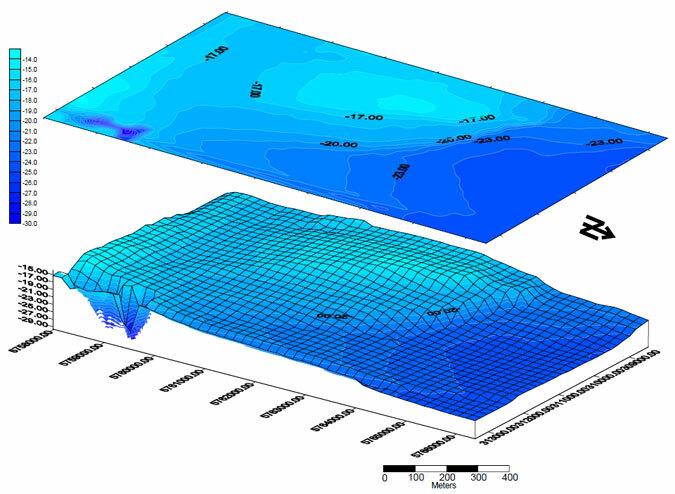 ownership of stock on the seafloor. The Plan will provide the basis for the management of the PCAFR for a period of three years and, prior to its expiry, it will be reviewed. Implementation of the Plan will require actions by Government in respect of certain policy matters, by Department of Primary Industries in respect of day-to-day management, and by other stakeholder entities. To this end the Plan includes a detailed implementation section addressing key actions of the Plan. The purpose of the Pinnace Channel Aquaculture Fisheries Reserve Management Plan ('the Plan') is to specify the policies and strategies for managing activity within the Pinnace Channel Aquaculture Fisheries Reserve (PCAFR). The Plan prescribes management arrangements for the PCAFR that provides for a significant commercial supply of high quality seafood within a framework of Ecologically Sustainable Development (ESD). The Ministerial guidelines for the preparation of the Plan were published in the Victoria Government Gazette on 31 July 2003 and are shown in Appendix 1. To assist the reader, a list of acronyms and abbreviations used throughout the text is provided in Appendix 2 and definitions for terms are provided in Appendix 3. The implementation of the Plan will be facilitated by the development of policies and tools. The aquaculture industry in Port Phillip Bay (PPB) has been established for around 25 years, with longline culture of blue mussels (Mytilus edulis) the predominant activity. The blue mussel is a filter feeding bivalve shellfish found throughout southern Australia. Victorian blue mussels are renowned for their tender flesh and delicious flavour. In 2003/04 the Victorian mussel aquaculture industry, based in PPB and Western Port, produced approximately 1100 tonnes of mussels, worth over $3.1 million, and is the largest mussel production industry in Australia. Mussel farming is predominantly based on natural settlement of spat, with spat collection undertaken in PPB during winter. In 2002, hatchery production of mussel spat in Victoria was undertaken for the first time and these spat are currently ongrowing in PPB. Mussels are harvested after 15-18 months growout on longlines, and fetch between $1.80-2.50/kg wholesale. Most product is harvested for human consumption and sold live in the shell on the domestic market. However further processing and value-adding, including smoked, marinated and vacuum packed product is being investigated by the industry. Some mussels are produced for bait and spat only. Mussel aquaculture is currently undertaken in designated harvesting areas within PPB, including large areas at Grassy Point and Clifton Springs, and smaller areas at Beaumaris and Dromana. Individual licence sites1 are generally 3 ha. A range of growing locations and conditions allows for almost year-round availability of mussels, and site diversity helps protect growers from the effects of nuisance algal blooms. Currently within PPB there are 22 aquaculture licences authorising harvest for human consumption from sites totalling 126 ha, and one aquaculture licence and one general permit authorising harvest for bait or spat from two 3 ha sites (Table 1). Cage culture2 of abalone (Haliotis rubra, H. laevigata and hybrids) within PPB has also been undertaken. This form of aquaculture is in the experimental or developmental phase and significant commercial production has not yet been realised. Table 1: Summary of location, licence type, number of licence holders and total area for established marine aquaculture zones in Port Phillip Bay. A major factor identified as limiting marine aquaculture development in Victoria was a lack of access to suitable sites in marine waters. To address this and other issues, the Environment Conservation Council (ECC), at the request of the Victorian Government, completed an investigation of the State's marine, coastal and estuarine areas. Following extensive research, consultation and consideration of environmental, social and economic implications, the ECC prepared recommendations on a system of marine protected areas and areas suitable for marine aquaculture in their final report (ECC 2000). In their final report the ECC recommended 12 marine aquaculture zones, including two land based zones, in areas that have demonstrated successful aquaculture performance or growth of target species in the past or, on advice from Fisheries Victoria and industry, would be suitable for target species. The zones total 2682 ha including 983 ha of currently farmed area. The ECC also recommended each aquaculture area be subject to preparation of a management plan. It was noted by the ECC that sites within the recommended marine aquaculture zones not be allocated prior to the development of management plans (recommendation 41). The Victorian Government has endorsed all the recommendations of the ECC for marine aquaculture, including the 12 marine aquaculture zones. The Victorian Government response to the recommendations of the Final Report of the ECC's Marine Coastal and Estuarine Investigation (2000) for marine aquaculture is provided in Appendix 4. Development of the Pinnace Channel Aquaculture Zone (recommendation E11, ECC 2000) has been given the highest priority of the government endorsed aquaculture zones. The Pinnace Channel Aquaculture Zone was declared as a fisheries reserve by Order in Council in accordance with section 88 of the Fisheries Act on 6 March 200Under the Fisheries Act a management plan must be prepared in respect of a fisheries reserve as soon as possible after the fisheries reserve is declared. The PCAFR is a greenfield area with no current commercial aquaculture activity although some research has been undertaken in the fisheries reserve. Previous information on aquaculture activity in PPB generally provides background to the aquaculture activity likely to occur within the PCAFR. A detailed description of the attributes of the PCAFR is provided in Appendix 5; a summary of that description is provided in this section. The location of the PCAFR is shown in Figure 1. PCAFR is comprised of two 500 ha blocks (approximately 1.7 km by 2.8 km each) located on either side of the Pinnace Channel where it flows northwards from the Great Sands area. the Port Phillip Heads Marine National Park (at the closest point the separation distance is 3.1 km). Water depth in the blocks generally ranges from 15 to 24 m. The predominant sediment consists of sand and mud, and becomes muddier and of smaller mean grain size with increasing depth. The mud content of the sediment ranged from approximately 8 to 40%. Sandy, shallower areas at depth less than 20 m displayed a bedform dominated by mounds and depressions caused by callianassid shrimps, while the muddy sediments of depth greater than 20 m displayed a flat profile. Sediment carbon and nitrogen contents ranged from 1.4 to 5.6% and 0.06 to 0.19% respectively. The benthic fauna of PCAFR consists of many species represented by relatively few individuals found in one or two samples. Polychaete worms dominated. Other relatively abundant species are the crustacean Kalliapseudes sp. and the bivalves Chioneryx cardiodes and Corbula gibba (an exotic bivalve). Species diversity and density decreased with depth. Abundance of epifauna is generally low with less than 10 individuals per 100m (transect). The ascidian Pyura stalonifera was the most common species, followed by the native flat oyster, the ascidian Cnemidocarpa etheridgii and the scallop. Sparse Caulerpa sp. beds along with beds of an unidentified red alga are found at a depth of 20m or less. Both blocks of the PCAFR are subject to daily tidal flushing that generates considerable mixing and exchange of water. Current directions vary from the north to northeast on the flood tide, and from the northwest to south-southwest on the ebb tide. Peak currents generally range from 0.10 to 0.25 m/s. The predominant wind direction in southern PPB is from the south. The most common wind speed range was 20-30 km/h followed by the 30-40 km/h, 11-20 km/h, greater than 40 km/h, and 10 km/h or less. Wave modelling, and data from the adjacent Rosebud area, (Mornington Peninsula) indicates the predominant wave height at the PCAFR is likely to be between 0.5 and 1.0 m, with waves greater than 1.0 m occurring less than 8% of the time. Water temperature in the PCAFR is predominantly between 10 and 22°C. Salinity in the PCAFR generally ranges from 30 to 36 parts per thousand. The southern end of PPB generally has lower levels of chlorophyll a reflecting a lower concentration of phytoplankton in the area. However, good currents in the region may assist nutrient availability to shellfish. The high flushing rates and high exchange with Bass Strait water is considered to decrease the risk of harmful algal blooms within the PCAFR. There is little risk of contamination by faecal coliforms from land based sources within the PCAFR. The ports, infrastructure and provisions detailed in Table 2 are potentially available for industry to service the PCAFR. At present there is no commercial aquaculture activity within the PCAFR. Aquaculture research and development in the PCAFR, conducted by Fisheries Victoria in association with the Primary Industries Research Victoria Queenscliff Centre, (PIRVic, formerly the Marine and Freshwater Resources Institute) and industry, has included the experimental collection of scallop spat and the growout culture of scallop on both bottom and sub-surface longlines. The growout culture of akoya pearl oyster on sub-surface longlines and mussels on surface longlines is also being investigated. This research has indicated strong potential for expansion of commercial culture of bivalve shellfish into the PCAFR. Other research conducted in PPB relevant to the PCAFR includes suspension culture of native flat oyster and the development of translocation protocols for mussels to prevent the spread of exotic organisms. Port Phillip Bay is one of Australia's largest ports for national and international shipping and has defined routes for the movement of large commercial vessels within PPB to either Melbourne or Geelong. All vessels with a depth greater than 4-5 m that enter PPB must travel via the South Channel. After traversing the South Channel, vessels destined for Geelong turn at the Hovell Pile and proceed north-west to the Prince George Beacon. The shipping fairway, defined by a line between Hovell Pile and Prince George Beacon, is in close proximity to the northern block of the PCAFR. Fisheries Victoria, following consultation with the Victorian Channels Authority, will provide navigation marking off the northern block of the PCAFR to ensure clear separation of the PCAFR from commercial shipping activity. A notice to mariners indicating the location of the site and associated navigation infrastructure will be issued. The PCAFR and its surrounding waters are used for recreational boating, though the number of individuals that utilise the area is low when compared to other areas of PPB. The area is used for a small number of yacht races in the vicinity of the Mud Islands and down the Pinnace Channel. Boats also use the Pinnace Channel as a route to connect the South Channel and central PPB. The Pinnace Channel is 5.5 m deep and is situated approximately 1.3 km to the south-west of the PCAFR. A separation distance of approximately 1.8 km between the two blocks of the PCAFR provides a corridor for the continued use of Pinnace Channel by recreational boating. Recreational fishing is regarded by many in Victoria as one of the most important uses of PPB. The key recreational species in southern PPB are sand flathead (Platycephalus bassensis), southern calamari (Sepioteuthis australis), King George whiting (Sillaginodes punctata), southern sea garfish (Hyporhamphus melanochir) and snapper (Pagrus auratus). Productive snapper grounds are located in the vicinity of the PCAFR. The PCAFR is approximately 7.5 km from the nearest shore and does not contain fishing areas that are unique in PPB. Recreational diving is common throughout PPB with divers taking part in a range of activities including reef dives, wreck dives, photography, environmental monitoring, marine mammal viewing dives and collection of fish and shellfish. The PCAFR has limited appeal to recreational divers due to its lack of reef or unique substrate and its distance from shore. A possible attraction to recreational divers is the scallop beds located at or near the PCAFR, however the reserve is considered deep (16-25 m), and the scallop abundance is generally low, compared with other scallop beds in PPB. As a result, recreational divers do not generally use the PCAFR for scallop collection. The charter boat industry in PPB provides recreational fishing, aquatic mammal viewing and diving services. The nature of the environment within the PCAFR and the relative absence of aquatic mammals in this area suggest that the PCAFR is not a major charter boat destination at the present time. It should be noted, however, that the infrastructure to be developed for commercial aquaculture within the PCAFR may attract fish, leading to an increased use of the area by charter boats in the future. Victoria's bay and inlet fishery provides seafood year round valued at over $7 million annually (2003/4). One of the key bay and inlet fisheries occurs in PPB with an average annual value of $3 million (2000-2004). The key species (and the average annual landed value between 2000-2004) caught in PPB are King George whiting ($849,000), southern calamari ($419,000), pilchards ($291,000), snapper ($480,000) and southern anchovy ($258,000). These five species account for almost 80% of the PPB catch based on value. Information on the PPB fishery is recorded and published by Fisheries Victoria. The catch and effort data are recorded for different areas of PPB based on grids. The PCAFR brackets four reporting grids. These grids total approximately 260 square km. The average annual commercial fishing catch value (2000-2004) within the grids was $263,000, made up predominantly of pilchards at 37%, King George whiting at 14%, snapper at 14% and southern calamari at 12%. The PCAFR covers approximately 4% of the four reporting grids described above. The majority of the PCAFR is located in grid F7, which produces an average annual catch (2000-2004) of $92,000. The predominant species caught in this grid is pilchards which are caught using purse seine nets. These nets are often set close to the banks and the mouth of the channels within the Great Sands area. The PCAFR is located in deeper waters that are not traditionally used for whiting fishing. Furthermore, the PCAFR occupies a small percentage of the existing commercial fishing grounds for southern calamari and snapper. The other species caught within the 4 grids are of low economic value and a reduction of 4% of their fishing area will have little or no impact on catch rates. 'to promote sustainable commercial fishing and viable aquaculture industries and quality recreational fishing opportunities for the present and future generations'. To deliver on these objectives Fisheries Victoria provides the core functions of licensing, administration, policy development and management planning. In addition, Fisheries Victoria provides resources for research and development, regional extension, fish health management and shellfish quality assurance. to provide a coordinated approach to approvals for the use and development of coastal Crown Land. The Land Act 1958 (the Land Act) provides for the granting of leases and licences for the use of Crown Land. Section 134 of the Land Act provides for the issue of leases for non-agricultural purposes (for example aquaculture). Section 134 leases provide exclusive occupancy rights. The Environment Protection Act 1970 (the Environment Protection Act) makes provisions for 'the protection of the environment'. Accordingly the Environment Protection Act provides for the regulation of discharge of waste into the environment, the prevention and control of pollution and noise, the protection and improvement of the quality of the environment, and specification of standards and criteria for the protection of beneficial uses (including aquaculture). The Victorian Government has jurisdiction over marine aquaculture within the State's waters. The Government has endorsed zones within the estuarine and marine waters of Victoria for aquaculture development. These zones correspond with the zones recommended for marine aquaculture by ECC in the final report of their Marine Coastal and Estuarine Investigation (ECC 2000). The ECC noted it was expected these zones be established as fisheries reserves under section 88 of the Fisheries Act. The zones have been declared as fisheries reserves for the purposes of aquaculture and management plans are to be prepared for each fisheries reserve under Part three of the Fisheries Act. Aquaculture activity is authorised by aquaculture licences issued under the Fisheries Act. An aquaculture licence gives an aquaculturist the authority to conduct aquaculture activity in a specified area (the licence site) for a specified period. Aquaculture licences list the specified area, specify the species of fish (as defined under the Fisheries Act) that may be farmed, the licence period (generally 12 months), harvesting restrictions and quality assurance programs, production return requirements, operational management controls and environmental management provisions. For the purpose of the Fisheries Act an aquaculture licence is a prescribed class of renewable and transferable fishery licence. The Fisheries Act currently prescribes classes of aquaculture licences that may specify Crown Land including: Aquaculture (Crown Land - Other), Aquaculture (Crown Land - Bivalve Shellfish), and Aquaculture (Crown Land - Abalone) Licence. to use commercial aquaculture equipment specified in the licence. tto use commercial aquaculture equipment specified in the licence. Holders of an Aquaculture (Crown Land - Bivalve Shellfish) Licence are required to participate in the Victorian Shellfish Quality Assurance Program (VSQAP). to sell abalone (including a commercial quantity) which has been hatched, reared, bred, displayed or grown under the licence at the area specified in the licence. In accordance with the Fisheries Act, aquaculture licences are subject to any conditions imposed by the Fisheries Act, any conditions that are set out in the Fisheries Regulations 1998 (the Fisheries Regulations) and any conditions that the Secretary, DPI thinks appropriate and that are expressed or referred to in the licence. Failure to comply with a condition of a fishery licence is an offence under the Fisheries Act. The VSQAP operates within Victoria monitoring aquaculture harvesting areas from which bivalve shellfish may be harvested for human consumption. The VSQAP is the Victorian implementation of the Australian Shellfish Quality Assurance Program (ASQAP), an internationally recognised program. Aquaculture fisheries reserves compliant with the VSQAP may be accredited for the harvest of product for export. Fisheries Victoria is presently responsible for administering the VSQAP. The monitoring component of the program has been outsourced. Shellfish quality assurance has occurred in Victoria since 1987. Aquaculture (Crown Land ' Bivalve Shellfish) Licences entitle commercial production of bivalve shellfish for the purposes of human consumption and establishes a formula for calculating an industry VSQAP levy. The industry VSQAP levy represents one-third of the total costs of administering the VSQAP program as determined by the Secretary, DPI. The levy does not apply to farmers only producing bivalve spat for the purposes of ongrowing, or bait. Shellfish harvesting for human consumption is regulated by harvest area closures using precautionary rainfall and phytoplankton triggers (Appendix 6). In addition, biotoxin events are managed under the Biotoxin Management Plan 2004. An aquaculture compliance strategy has been developed for the Port Phillip Region and includes the PCAFR. The strategy identifies compliance with licence conditions and lease clauses, including infrastructure type and location, labelling, and activity undertaken within the PCAFR, as a priority. Compliance with the VSQAP, and in particular harvesting closures, to protect human health is also a priority of the strategy. The co-management of fisheries and aquaculture within Victoria is a process involving four groups of entities. The first comprises the peak bodies: the Seafood Industry Victoria (SIV), VRFish (Victorian Recreational Fishing Peak Body), and the Victorian National Parks Association (VNPA). The second group for marine aquaculture in Victoria comprises of existing aquaculture operators represented by bodies such as the Victorian Marine Farmers Incorporated and the Victorian Abalone Growers Association. The next group comprises the Fisheries Co-Management Council (FCC) and its technical based committee. The fourth group is the government agencies, including the DPI of which Fisheries Victoria is a Division. The above co-management entities will ensure that the marine aquaculture industry is appropriately represented during consultation regarding decisions that may impact on the industry. Part three of the Fisheries Act provides the legislative framework for the preparation of management plans. The Fisheries Act also provides the means for the Secretary, DPI to implement the recommendations of a management plan. The Fisheries Regulations and licence conditions provide the statutory rules and licence entitlements and conditions governing commercial aquaculture. finalisation of the draft management plan following stakeholder submissions. The PCAFR Management Plan was prepared by Fisheries Victoria, assisted by a steering committee comprising of representatives from key stakeholders including the peak bodies (VRFish and SIV) recognised under the Fisheries Act, the FCC, the DPI and the Department of Sustainability and Environment (DSE) (Appendix 7). Industry expertise was provided by the VAC (formerly the aquaculture peak body until 2004). The role of the steering committee was to advise the Executive Director, Fisheries Victoria, DPI with respect to the conformance of the Plan with the requirements of the Fisheries Act and the Ministerial guidelines, and to respond to community consultation on the draft Plan. The issues that are presented in the Plan have been identified from other management plans in Victoria, other states and countries, consultation with industry and government agencies, and other documentation such as policies, plans, research reports and assessments (including an expert panel risk assessment; see below). The issues addressed include the requirements of the Fisheries Act, Ministerial guidelines issued in respect of the fisheries reserves and emerging issues. In cases where a number of issues arise within a topic, these issues are presented under subheadings which identify the particular issues. Victorian Government response to the ENRC Inquiry into Utilisation of Victorian Native Flora and Fauna 2000. As previously stated, the purpose of the Plan is to ensure the management of the PCAFR is undertaken within an ESD framework, which incorporates principles of environmental sustainability, economic viability, social equity and governance. Accordingly the Plan addresses objectives under four key headings. A key aspect of the Plan is to provide for the sustainable use of the natural resources within the PCAFR. To this end the Plan specifies ecological objectives, strategies, performance indicators, reference points and management triggers for the PCAFR. Additionally, the Plan specifies environmental survey, monitoring and reporting requirements to assess the effectiveness of management, in association with formal processes for deciding on appropriate actions in the event of adverse outcomes. The Plan aims to promote the development of an efficient, effective and economically viable aquaculture industry. In pursuit of this aim, the Plan provides for the maximum sustainable level of development, research and development, the appropriate allocation of water and security of occupancy rights. An important goal of the Plan is the management of the PCAFR that provides for, as far as possible, social equity. To this end the Plan recognises the rights of other users of the marine environment. The Plan will provide for maximum benefit to the community and promote those benefits to the broader community. In respect of governance, the Plan aims to provide clear, transparent and cost-effective management of the PCAFR. In pursuit of this goal the Plan will be consistent with government legislation and policies on resource allocation, the issuing of aquaculture licences and Crown leases and recovery of attributed costs. The Plan will also address the regulation of licensed activities with the aim of maximising compliance. This will be achieved by developing a compliance framework including the development of a compliance strategy and through the quantification and monitoring of enforcement targets. Additionally, the Plan provides for the appropriate level of clear and timely reporting to the community in relation to the ecological and commercial status of the PCAFR. The key issues and risks associated with each objective of the Plan were identified through an expertise based risk assessment. This assessment followed the Australian/New Zealand Standard for Risk Management (AS/NZS 4360:1999). Aquaculture may impact on the marine environment, however the actual risks associated with marine aquaculture development are site specific depending on the species, location (characteristics and sensitivity), culture system and husbandry methods employed. Site specific risks have been assessed for the PCAFR and management measures are detailed in the Plan. Bivalve shellfish will initially dominate aquaculture activity at the PCAFR, with the potential development of abalone cage culture. Bivalve shellfish are farmed using techniques reliant on natural productivity (no active feeding), resulting in a net removal of nutrients from the water column at harvest. Cage abalone aquaculture requires use of harvested macroalgae and or artificial feeds (active feeding) in addition to natural productivity. The ecosystem issues associated with bivalve shellfish and abalone cage culture are summarised in Appendix 6. Finfish aquaculture will only be considered on a research and development basis. There will be no commercial culture of finfish within the life of the Plan. The Plan will provide the basis for the management of the PCAFR for a period of three years. Prior to that time the Plan will be subject to review. Should there be a need for the Minister to amend the Plan prior to its review, notice of this intention will be published in the Victoria Government Gazette and there will be formal consultation with stakeholder groups. to provide management responsiveness to changes in the ecological health within the PCAFR and adjacent areas. monitor areas and functions of licence holders and instigate appropriate management actions. to enhance commercial production by facilitating appropriate research and development. specify the minimum rate of infrastructure development on aquaculture sites within the PCAFR. to facilitate maximum benefit to the community where there is private commercial use of a publicly owned resource. increase awareness of the PCAFR aquaculture and its associated regional economic development and employment to the wider community. to ensure licensed activities are appropriately regulated according to legislation. establish compliance criteria and recognise compliance management strategies. Performance indicators are quantities to be measured in order to track the status of the PCAFR relevant to the stated objectives. Reference points represent the status management wishes to achieve. When the status is unacceptable, management triggers indicate the requirement for an appropriate remedial action. Performance indicators, reference points and management triggers for the Plan are shown in Table 3 and have been assigned to each of the PCAFR objectives, where appropriate. Current information does not allow for the precise definition of all performance indicators and reference points and further research is required to provide this information. It should be noted that the action resulting from non-compliance of a management trigger is described under the relevant section in the Plan. However, in those cases, where there is not a clear action described in the Plan, the action resulting from non-compliance of a management trigger will be a review of the particular issue. The Plan makes recommendations on the responsibilities of Crown lease and aquaculture licence holders. These responsibilities are summarised in Appendix 8. (a) Management objectives are directly relevant to one or more of the listed objectives of the Plan or parts thereof. (b) Some reference points will be further elucidated during the life of the Plan. (c) Some management triggers will be further elucidated during the life of the Plan. (d) Indices of ecological health are to reflect ecological parameters considered to be linked to aquaculture practices and or to the wellbeing of the aquaculture industry such as water quality and benthic habitat. (e) Compliance indices will include, but not be limited to, numbers and hours of quality inspections, and numbers and types of warnings and offences. The declaration of the PCAFR provides the opportunity for increased production of presently cultured species, as well as the opportunity for the commercial and experimental culture of new species. the relevant fishery management plans, including the Victorian Abalone Fishery Management Plan 2002. The culture of finfish in the PCAFR will not be permitted in the life of the Plan. At present adequate information on the environmental impacts and associated management of commercial finfish aquaculture in PPB is not available. To address the information gaps, appropriate research and development on finfish culture in the PCAFR will only be conducted to provide relevant, creditable information on the ecological sustainability of such activity. Any finfish research will be designed and evaluated in conjunction with the DSE and the Environment Protection Authority (EPA). All research and development will be subject to conditions prescribed in the 'Research and development' section of the Plan. Abalone ranching3 will not be permitted in the life of the Plan. At present, adequate information on the environmental impacts and associated management is not available for ranching of abalone. Culture of other species may be permitted provided they meet the requirements of relevant legislation and policy, and can be adequately managed within an ESD-based framework. A Crown lease for marine aquaculture will be issued under the Land Act to a leaseholder and will provide exclusive occupancy right over a site for aquaculture purposes. An aquaculture licence will be issued under the Fisheries Act to a licence holder and will authorise an operator to conduct aquaculture activity on a specified area. Consent under the Coastal Management Act will authorise the use and development of coastal Crown Land. Entitlements of a Crown lease for marine aquaculture will be consistent with the Victorian Aquaculture fisheries reserves - leasing and licensing policy. It should be noted the Crown lease will provide occupancy rights for the purpose of conducting aquaculture activity, while the aquaculture activity will be authorised by an aquaculture licence. Crown leases within the PCAFR will be allocated consistent with the Victorian Aquaculture fisheries reserves - leasing and licensing policy. Accordingly the Plan concerns management of those sites and associated aquaculture activity once allocated, rather than the specifics of the allocation mechanism. The transfer, amalgamation, subdivision and subleasing of Crown leases within the PCAFR will be consistent with the Victorian Aquaculture fisheries reserves - leasing and licensing policy. Aquaculture licences issued under the Fisheries Act will provide authority to the licence holder to conduct aquaculture activity within the PCAFR. An aquaculture licence specifying an area within the PCAFR will only be issued, renewed or transferred if consistent with the Victorian Aquaculture fisheries reserves - leasing and licensing policy. Cost recovery for management of the PCAFR will occur through the implementation of levies on aquaculture licences. Existing legislation provides that levies may only be prescribed for a class of fishery licence. In order to comply with this legislation and facilitate cost recovery, Fisheries Victoria will develop classes of aquaculture licence that may authorise aquaculture activity within the PCAFR. Of these, one will relate to the authority to harvest bivalve shellfish for human consumption and others will relate to the authority to culture aquaculture product for purposes other than the harvest of bivalve shellfish for human consumption. In addition, general permits will be issued as required to conduct aquaculture activity for research and development purposes. Research and development under the provisions of a general permit may only be conducted within a defined research and development site within the PCAFR (refer to Research and development). General permits will not be allocated for other sites within the PCAFR. The Government supports marine aquaculture initiatives subject to appropriate environmental management. publicly available reports' (recommendation 43). 'Such detail will be outlined in the Management Plans for aquaculture zones, which will be released for public comment. The Management Plan will also give consideration to the indicators mentioned above, amongst others, and specify the frequency of public reporting'. Fisheries Victoria has reviewed the methods for environmental surveying and monitoring of marine aquaculture in Victorian waters (Gavine and McKinnon 2002) (see Table 4 for summary), which provides the technical basis for implementation of the environmental management framework within the PCAFR. This framework will provide information to enable management decision making, ensuring that the impact of aquaculture will be maintained at a level that is acceptable, local and reversible by natural processes. Sediment Chemistry ORP Redox ✔ Annually Beggiatoa sp. mats and or organic accumulation and or debris present beneath culture infrastructure, and or at compliance point on video transect. Table 4: Variables and methods for environmental surveys and monitoring (Source: modified from Gavine and McKinnon, 2002). A characterisation survey is a broad, one-off assessment of the habitat, physico-chemical and biological attributes of an aquaculture fisheries reserve. To identify the key environmental attributes of the PCAFR and relevant reference sites for future monitoring, Fisheries Victoria has undertaken a characterisation survey of the PCAFR (Barry and Bailey 2001; Coleman et al. 2001)5. The results of this survey are summarised in Appendix 5. Prior to the review of the Plan, Fisheries Victoria will undertake environmental assessment of the appropriate reference sites to monitor impacts within, and external to, the PCAFR. A one-off baseline survey is to be undertaken as soon as practicable after the Crown lease has been issued and prior to commencing aquaculture activity. A baseline survey is an initial assessment of the sediment and seabed (see Table 4) specific to the Crown lease site. This survey will include predetermined compliance point(s)6 outside the Crown lease site (reference sites) for the purpose of future ongoing monitoring by the aquaculture licence holder. It will be the responsibility of the Crown lease holder to undertake and fund the baseline survey for each Crown lease site. The requirements of the baseline surveys will be specified by the Secretary, DPI and prescribed as lease clauses. A written report on all baseline surveys is to be provided to Fisheries Victoria by the date specified by the Secretary, DPI. The report will provide a summary of data collected, methods employed, analysis of the data, and recommendations and conclusions. All original data, video footage and samples should be retained by the Crown lease holder for auditing purposes for a period of time as specified by the Secretary, DPI. Ongoing monitoring is to be undertaken subsequent to the baseline surveys on an annual basis, or at intervals specified by the Secretary, DPI. Monitoring refers to ongoing assessment of the sediment and seabed (see Table 4) of the aquaculture licence sites. Ongoing monitoring will include assessment of relevant reference sites and provide sufficient information on the performance indicators to determine whether reference points are being achieved. It will be the responsibility of the licence holder to undertake and fund the ongoing monitoring. The ongoing monitoring will be specified by the Secretary, DPI and prescribed as licence conditions. A written report on all ongoing monitoring is to be provided to Fisheries Victoria by the date specified by the Secretary, DPI. The report will provide a summary of data collected, methods employed, analysis of the data, and recommendations and conclusions. All original data, video footage and samples should be retained by the licence holder for auditing purposes for a period of time specified by the Secretary, DPI. Guidelines prepared by Fisheries Victoria in consultation with the relevant agencies will prescribe detailed methods and standards for undertaking baseline surveys and ongoing monitoring. These guidelines will include a description of the following key parameters: physico-chemical analysis of the sediment (particle/sediment grain size analysis, oxidation reduction potential, total organic carbon, carbon to nitrogen ratios and natural stable isotope analysis), biological analysis of the sediment, seabed characteristics and habitat profile (habitat mapping, underwater video survey), and water column. All baseline surveys and ongoing monitoring are to be conducted using the prescribed methods and in accordance with the prescribed standards unless otherwise authorised. The guidelines will also provide for reporting and auditing of all survey and monitoring results. Fisheries Victoria will develop a data management system with geographical information system overlay capable of storing, analysing and reporting on all survey and monitoring data. Environmental standards for aquaculture activity within the PCAFR are impacts that are acceptable, local and reversible by natural processes. In the event the environmental standards are not met, appropriate remediation action will be undertaken. Environmental performance indicators, management triggers and associated remediation actions for marine aquaculture activities are described in Table 5. Remediation of the site will be at the direction of the Secretary, DPI. The undertaking of remedial actions will be the responsibility of the aquaculture licence holder. Fisheries Victoria will be responsible for evaluating whether performance indicators are meeting reference points, or if management triggers have been activated, and for determining the appropriate management responses. Continual review of environmental monitoring information, combined with the ability to vary licence conditions relating to environmental monitoring, provides for adaptive management to reflect effective and efficient management response to changing conditions. Public reporting on environmental monitoring undertaken within the PCAFR is a primary component of public accountability for the management of the PCAFR. Fisheries Victoria will publish all characterisation survey information. All baseline survey and ongoing monitoring information will be available to the public. Fisheries Victoria will provide annual summaries of this information. The Organisation Internationales Epizootiques (OIE) is the international organisation responsible for the International Aquatic Animal Health Code (OIE 2004). Australia is a member country of the OIE. Australia's responsibilities under the OIE for aquatic animal diseases are reflected in the Aquaplan Control Centre Manual (AFFA, 2001), overseen by the Commonwealth Committee for Animal Emergency Diseases. Victoria's national aquatic animal disease reporting requirements are reflected in Victoria's Arrangements for the Management of Aquatic Animal Disease Emergencies 2003. Further it is a requirement under the Fisheries Act and the Livestock Disease Control Act 1984 that prescribed notifiable diseases are reported to the Secretary, DPI and the Chief Veterinary Officer, DPI respectively. The degree of disease risk for marine aquaculture at the PCAFR will vary with the choice of culture species and system, the standard of management, and the prevailing environmental conditions in and around the aquaculture areas. In relation to the farm management component, the prescribed procedures and protocols adopted by industry to avoid, mitigate and or treat disease incidents will be critical to ensuring disease risks are (economically and environmentally) manageable. All aquaculture licence holders within the PCAFR must comply with the appropriate disease reporting requirements and management response initiatives. The risk of disease transmission into and out of the PCAFR will be managed under the Guidelines for Assessing Translocations of Live Aquatic Organisms in Victoria 2003. During the life of the Plan, Fisheries Victoria, in consultation with the Chief Veterinary Officer, DPI and industry will investigate whether an active disease surveillance program for the PCAFR is warranted. Translocations will be conducted in accordance with the Guidelines for Assessing Translocations of Live Aquatic Organisms in Victoria 2003 and any associated protocols approved by the Secretary, DPI. Interim translocation protocols include The Revised Victorian Mussel Translocation Protocol for the Movement of Mussel Ropes and Equipment between Port Phillip Bay and Western Port 2004 are to be used when appropriate. Fisheries Victoria will develop further translocation protocols as appropriate. Table 5: Environmental performance indicators, management triggers and associated remediation actions for marine aquaculture activities (Source: modified from Gavine and McKinnon, 2002). The VSQAP is the Victorian implementation of the ASQAP, an internationally recognised program. The VSQAP is a quality assurance program protecting human health through the active monitoring of shellfish harvesting areas (fisheries reserves). Aquaculture fisheries reserves compliant with the ASQAP will be accredited for the harvest of product for export. The VSQAP will be extended to include the PCAFR. Proponents harvesting bivalve shellfish for human consumption must hold a relevant Aquaculture (Crown Land - Bivalve Shellfish) licence and contribute to the costs of the VSQAP. All bivalve shellfish harvested for human consumption must be compliant with the VSQAP. The PCAFR is located distant to most potential sources of pollution that would restrict harvest for human consumption and or export clearance for product harvested from the reserve, as defined by the ASQAP. Combined with potential for large quantities of bivalve shell stock to be produced within the reserve, the PCAFR is a prime location to grow and harvest bivalve shellfish for export. It is intended that export accreditation for the shell stock harvested from the PCAFR will be achieved via the VSQAP process as soon as possible after the allocation of Crown leases within the reserve. The Seafood Safety Act 2003 (the Seafood Safety Act) requires that all aquaculture licence holders producing product for human consumption hold a licence issued under that Act (administered by PrimeSafe). The Minister responsible for the Seafood Safety Act may declare that a class of seafood licence is to have a food safety program. Holders of those licences will have to prepare and implement food safety plans that specify the Hazard Analysis Critical Control Points through supply-chain food safety requirements. Bivalve shellfish are farmed using techniques reliant on natural productivity. Cage abalone aquaculture requires active feeding with natural macroalgae and or artificial feeds. Commercial culture of finfish will not be permitted in the PCAFR for the life of the Plan. Schedule F6 (Waters of Port Phillip Bay) of the State Environment Protection Policy (Waters of Victoria) 2003 (SEPP) requires a 1000 tonne net reduction in the annual net nitrogen load to PPB by 2006. The Port Phillip Bay Environmental Management Plan 2003 (PPBEMP) has been prepared to help achieve the objectives of the SEPP. This plan includes strategies to achieve the net nitrogen reduction outlined by the SEPP. The PCAFR will be developed in accordance with the SEPP and the requirements of the associated PPBEMP. Any aquaculture proposals that require active feeding of artificial feeds will therefore be required to comply with the SEPP, including the requirement for a net reduction in nutrient loads, and be consistent with the PPBEMP. Commercial aquaculture activity requiring use of artificial feeds in the PCAFR will only be considered if it can be demonstrated that such operations can meet the requirements of the SEPP, and are consistent with the PPBEMP. Research and development activities in relation to the use of artificial feeds in the PCAFR will be permitted on the basis that it is designed to provide relevant, scientifically defensible information on the ecological sustainability of such activity. All research and development will be subject to the conditions prescribed in the 'Research and development' section of the Plan. Within this context, the potential application of nutrient offset mechanisms8 will be investigated. A condition on all aquaculture licences is that the licence holder must complete an aquaculture production return. These data are provided to meet Fisheries Victoria's state, national and international reporting requirements. Production data are made available to the public by Fisheries Victoria in the Commercial Fish Production Bulletin for each financial year. The public will be informed on the production from the PCAFR. All production information for the PCAFR may be reported to the public, including the species cultured, the tonnage and value of product, and the employment created. The annual Commercial Fish Production Bulletin provides a mechanism for providing these data to the public. All information provided on production within the PCAFR will be in a form that protects commercial confidentiality of individual licence holders, providing this requirement does not prevent production reporting for the PCAFR. Fisheries Victoria, following consultation with relevant industry representatives and existing licence holders, will determine the reporting requirements for financial performance indicators. areas within the PCAFR that have not been specified on Crown leases and or aquaculture licences. The Victorian Government response to the ECC (2000) recommendations provided that other users could access the aquaculture fisheries reserve but not the Crown lease sites. General public access will only be permitted to areas of the PCAFR that are not leased or licensed. The external boundaries of the leased sites will be marked in accordance with the provisions of the Marine Act 1988 (the Marine Act) to provide the appropriate indication to other users of restricted access areas. A communication strategy will be developed in consultation with relevant industry representatives and VRFish to inform the public and industry of the entitlements of other users. The compliance strategy developed relating to the PCAFR will address compliance with access restrictions. the compliance strategy relating to the PCAFR will recognise that the disposal of human sewage and other litter in PPB is illegal under the Environment Protection Act. Providing Crown leases within the PCAFR is an alienation of Crown land. It is therefore appropriate to ensure that all lease sites are accurately surveyed and marked to the appropriate standard. Surveying of aquaculture sites must be of a standard considered appropriate for issuing of Crown leases. Standards of surveying for the granting of registered Crown leases are the responsibility of the Surveyor General Victoria and Land Registry, Land Victoria and DSE. Independent Licensed Surveyors will conduct the surveying. The DPI will provide guidelines for surveying of marine waters for the purposes of Crown leasing in conjunction with the Surveyor General Victoria. Crown lease sites within the PCAFR are to be surveyed by the Crown lease holder at their expense, prior to placing any commercial aquaculture equipment on the lease site. is undertaken by a qualified surveyor or other person approved by the Secretary. is suitable for registering on a Crown lease. indicates the location of a licence holder's commercial aquaculture equipment in relation to boundaries of the aquaculture sites specified on this licence. In regard to the accurate marking of site boundaries this licence condition will be adapted as a standard Crown lease clause. The maintenance of aquaculture equipment within the Crown lease boundaries is the responsibility of the aquaculture licence holder. Local currents, wind and wave action can affect the location and alignment of aquaculture infrastructure. Fisheries Victoria will undertake regular monitoring and enforcement of the location of commercial aquaculture equipment. Any survey in relation to the location of aquaculture equipment on an aquaculture Crown lease requested by the Secretary, DPI for compliance purposes will be undertaken at the expense of the aquaculture licence holder. In addition, any cost for relocation of equipment will be borne by the aquaculture licence holder. Existing aquaculture within PPB is generally conducted in large aquaculture zones within which aquaculture licence holders are allocated individual 3 ha sites. The boundaries of the larger existing aquaculture zones at Clifton Springs and Grassy Point are delineated by navigation markers consistent with the requirements of the appropriate authorities under the Marine Act. These navigation markers were deployed and are maintained by Fisheries Victoria. Currently aquaculture licence holders are required to mark each corner of each licensed site with a buoy bearing the licence holder's number. Deployment and maintenance of these buoys are the responsibility of the licence holders. The external boundaries of the PCAFR will be marked by Fisheries Victoria in accordance with the requirements of the appropriate authorities under the Marine Act. To ensure all navigation marks are in the correct working order Fisheries Victoria will prepare and implement a program for the regular inspection and maintenance of all navigation marks for the external boundaries of the PCAFR. Fisheries Victoria will implement a system to recover all cost associated with the inspection and maintenance of navigation marks for the external boundaries of the PCAFR from the aquaculture licence holders. The recovery of these costs should be levied on licence holders receiving benefits pro rata on the basis of area licensed. Crown lease holders will be required to mark the external boundaries of the lease site with boundary marks in accordance with the requirements of the appropriate authorities under the Marine Act and regularly inspect and maintain boundary infrastructure at their own expense. All aquaculture sites will be surveyed and marked appropriately before commercial aquaculture equipment is deployed. Fisheries Victoria will communicate information regarding the type and location of navigation markers for the PCAFR to other users. The ECC (2000) recommended that management plans prepared for marine aquaculture fisheries reserves include 'design, construction, maintenance and visual impact of structures' (recommendation 41). It is appropriate that the Plan considers conventions to reduce the visual impacts associated with aquaculture infrastructure within the PCAFR. The visual impacts discussed here are those associated with commercial aquaculture equipment only, and not navigation marking infrastructure (as previously described). At present the marine aquaculture industry within PPB uses a variety of visible infrastructure (size, shape and colour) on licensed sites to support aquaculture equipment. In the PCAFR the use of low profile, dark coloured buoys will reduce the visual impact of this infrastructure. All buoys (non-navigation marks) and other floating commercial aquaculture equipment within the PCAFR will be grey to black in colour or be any other colour that is specified by the Secretary, DPI. Commercial aquaculture equipment and support infrastructure in the PCAFR should be distinctive to the boundary marks of Crown lease areas and the PCAFR. Aquaculture infrastructure may detach creating a safety risk and litter the adjacent foreshore. The risk of detachment of buoys will be reduced by prescribing minimum standards for attachment of buoys to longlines in licence conditions. Maintenance of these standards will be addressed as part of the compliance strategy relating to the PCAFR. All floats and buoys associated with commercial aquaculture equipment and support infrastructure deployed within the PCAFR must be marked to allow the identification of the relevant aquaculture licence holder. The presence of redundant and or dilapidated commercial aquaculture equipment or associated infrastructure also affects visual amenity, environmental values and creates a safety hazard. The PCAFR must be kept in a neat and tidy manner and an aquaculture licence condition will be developed requiring all redundant or dilapidated commercial aquaculture equipment to be removed from the licence site upon request of the Secretary, DPI. The deployment of commercial aquaculture equipment and support infrastructure outside of the lease site creates a safety hazard to other users of the PCAFR. All commercial aquaculture equipment, including all anchors and mooring lines, and other support infrastructure located within the PCAFR must be located within Crown lease sites. The mooring of barges, boats and other structures within the PCAFR for periods longer than five consecutive days will require written approval from Fisheries Victoria, DPI. While technological advancements have improved the industry's productivity, eliance on motorised equipment may increase the incidence of noise. In addition, night time activity may occur. At present, night time aquaculture activity is predominantly associated with harvest events to meet market deadlines and or to beat advancing weather. The noise and light resulting from these activities has the potential to negatively impact other marine users and the marine environment. Therefore, growers must be sensitive to this issue and take the appropriate steps to minimise any potential impacts. making every reasonable effort to minimise light during night time operations. It is a requirement of the Plan that the above issues be considered in codes of practice developed by industry for application within the PCAFR. The role of environmental management plans in control of noise and lighting should be considered during the development of industry codes of practice within the life of the Plan. Waste management is an important environmental issue within the PCAFR. As the maintenance of water quality is of paramount importance to aquaculture ventures, poor waste management will also impact adversely on aquaculture operations. Potential wastes at the PCAFR include harvesting, cleaning, processing and mortality wastes; chemical and industrial waste; and sewage. Under the Environment Protection Act discharges to the marine environment must be managed so that they do not adversely affect the receiving environment. The SEPP establishes ambient water quality objectives and waste water discharge limits (based on the Australian Guidelines for Water Quality Monitoring and Reporting - Summary 2000) to protect these waters. Further, the Health Act 1958 (the Health Act) makes provisions for the prevention of conditions or activities that may be offensive or dangerous to the public, and the Food Act 1984 (the Food Act) requires the maintenance of prescribed food standards. onshore in appropriately designated areas subject to the provisions of local government, local water authorities and the EPA. Solid wastes from post-harvest processing of shellfish (for example shucking) must be disposed subject to the provision of local government, local water authorities and the EPA. In accordance with the Fisheries Act, abalone may only be processed at specified premises by the holder of a Fish Receivers (Abalone) Licence. As a result processing of abalone is not permitted within the PCAFR. Chemical use for marine bivalve aquaculture is limited to minor use of antifoulants. Any use of chemicals must be in accordance with the provision of all relevant statutes including the Environmental Protection Act and associated subordinate legislation. All chemicals used must be approved for use in the marine environment and should only be used according to manufacturer's specifications. Other chemical and industrial wastes in the PCAFR may include cleaning products and petroleum by-products such as diesel oil, motor oil and petrol. It is a requirement that the risk of impacts from these chemicals and industrial wastes will be dealt with by industry in accordance with relevant codes of practice and legislation. The role of environmental management plans in control of chemical and industrial wastes should be considered during the development of industry code of practice within the life of the Plan. Sewage contains a range of pathogenic microorganisms (including bacteria, viruses and protozoa) that pose a potential risk to the health of humans. Bivalve shellfish are particularly susceptible to effluent contamination. As a result the discharge of sewage into the marine environment in and adjacent to the PCAFR would pose significant human health risks through the potential contamination of aquaculture product. The disposal of human sewage at sea is illegal under the Environment Protection Act and the associated SEPPs. Determination of the total area of the PCAFR allocated to filter feeding shellfish culture and the maximum culture substrate per site allocated is based primarily on the carrying capacity of the PCAFR. Carrying capacity for commercial exploitation is defined as the quantity of standing stock (stocking rate) at which the annual production of a marketable crop is maximised. At a local scale, aquaculture stocking rates depend on constraints including substrate and oxygen availability, and food supply. For bivalves, the dominant factor determining the stocking rate is primary production (food supply). The stocking rate for bivalve shellfish is outlined below. The maximum stocking rate at the Crown lease and PCAFR levels, for species other than bivalve shellfish species may be specified prior to granting Crown leases within the PCAFR for each species on a case by case basis if required. Restriction of total production by area allocated and growing substrate controls allows the minimum economically viable lease size to be determined based upon standard production methods and return on investment. It is also noted in this context that return on investment is affected by economies of scale. For the purposes of this exercise a minimum scale of operation producing an acceptable rate of return and affording longterm viability will be applied. Fisheries Victoria, in consultation with industry, will determine the minimum lease size within the PCAFR, consistent with these parameters. Location and orientation of Crown leases within the PCAFR will reflect separation distances to maintain adequate water flow, buffer zones9 around the periphery of the PCAFR, the direction of currents and access to lease sites. Fisheries Victoria, in consultation with industry, will determine the location and orientation of lease sites within the PCAFR. Areas of the PCAFR other than those allocated for bivalve shellfish aquaculture or set aside for access/separation/ buffer zones may be used for the culture of other species that are actively fed and therefore not directly reliant on primary productivity (for example abalone). This use will be subject to approval of the Secretary, DPI and development of the appropriate input controls for these uses on a case by case basis. input controls related to length of longline. At present, approximately 30% of the total area of existing aquaculture zones within PPB is allocated for bivalve shellfish aquaculture. The maximum total area for bivalve shellfish aquaculture within the PCAFR will be 50%. Ongrowing substrate for bivalve shellfish aquaculture may be controlled by prescribing maximum length of longline backbone10 per ha of lease area. A maximum of 0.5 km of longline backbone will be permitted per ha in the PCAFR. This maximum will be prescribed as an aquaculture licence condition. Implementation of the PCAFR alienates a community resource for the exclusive use of the aquaculture industry. The Victorian community has an expectation that the resource will be used by the aquaculture industry in a manner that maximises the return to the community. Return to the community is achieved in part by aquaculture development within the PCAFR, output of commercially valuable aquaculture product, the creation of regional employment opportunities, and the provision of ancillary support services to the aquaculture industry. The specification of a minimum rate of development as a regulatory management tool is a mechanism used to ensure that the community will benefit from regional development, wealth creation and employment opportunities associated with a sustainable aquaculture industry. In addition, specified minimum rates of development make inappropriate investment speculation less likely and will encourage positive, legitimate and active development within the PCAFR. Fisheries Victoria will ensure that minimum rate of development provisions are developed for aquaculture licences and Crown leases. Aquaculture licence conditions prescribing minimum rates of development will be prepared for all aquaculture licences within the PCAFR. The development rates will be customised by Fisheries Victoria in consultation with the relevant stakeholders on a case by case basis and with reference to their development plan. Fisheries Victoria will ensure that provisions exist under the Fisheries Act to not renew licences when specified minimum development rates have not been met, subject to a 'show cause' provision. Where compelling reasons are offered in support of the renewal of a licence when minimum development rates have not been met, the licence may be renewed. Crown lease clauses will be developed to ensure that a Crown lease holder maintains a minimum rate of development on the Crown lease site. The Crown lease will stipulate a period of time within which minimum rates of development must first be met, and a maximum total number of years in which development may be below the specified level. stock that has originated from the aquaculture operation and has fallen to the seafloor. This stock may be attached to aquaculture infrastructure that has become detached, for example a mussel dropper, or may be the result of spat/stock detached from aquaculture infrastructure. This stock would be the same as the species authorised for culture. stock that has settled or migrated to the seafloor by natural processes without interference from the aquaculture operation. This stock may include species listed on the aquaculture licence and also other species. This stock on the seafloor may be considered as 'wild' stock. Any stock on the seafloor within the aquaculture licence site that directly results from the aquaculture activities, or is the same species as that authorised for cultured, may be retrieved by the aquaculture licence holder provided that it meets any appropriate health safety standards (for example the VSQAP) and licence conditions. Stocking of the seafloor for commercial harvest will not be permitted within the PCAFR within the life of this Plan. Any stock that is not a species listed on the aquaculture licence will not be accessible to the licence holder. Research and development is a tool to provide information to address risk and uncertainty, and as such facilitates the overall risk management and adaptive management approach of the Plan. needs of Crown lease holders and aquaculture licence holders within the PCAFR. A research and development site will be allocated within the PCAFR. All such research and development will address agreed priorities, be coordinated, be collaborative (where appropriate), and at the discretion of the Secretary, DPI. Research and development in this site will be pursuant to section 140 of the Fisheries Act that is research carried out by the Secretary. Reporting requirements and intellectual property ownership and management for research and development activities will be specified in research agreements as deemed appropriate by the Secretary, DPI. A research and development action plan for offshore marine aquaculture, which will include the PCAFR, will be developed, reviewed and updated annually. The research and development plan will be reviewed and updated annually. No general permits for research and development will be allocated for areas other than the research and development site. indemnify the State of Victoria, the Secretary DPI and their respective employees and agencies for personal injury, death and or property damage. All Crown lease holders must provide evidence of a current insurance policy to the Secretary, DPI prior to deploying aquaculture equipment and annually thereafter. All licence holders must provide evidence of a current insurance policy to the Secretary, DPI prior to licence renewal or upon request. The State is not at risk for personal liability or for product quality/recall provided that the relevant quality assurance programs are in place (including the VSQAP) and managed correctly. Accordingly, holders of aquaculture licences within the PCAFR will not be required to hold public liability insurance for product quality. However, it is suggested that holders of aquaculture licences producing product for human consumption hold an appropriate level of public liability insurance for product quality. bank guarantee option - lessees may establish an individual bank guarantee for the purposes of removal of commercial aquaculture equipment, calculated in accordance with the nature of equipment to be removed and the hectares under leasehold. Both options will be designed to accurately reflect the full cost of removing equipment, the risks of equipment abandonment relevant to the duration of the lease and, minimise the start-up cost for industry. Fisheries Victoria, in consultation with relevant industry representatives, will determine an agreed option for recovering the cost of removal of commercial aquaculture equipment. At present there are breeding populations of exotic marine species within PPB which have the potential to colonise commercial aquaculture equipment within the PCAFR. Management of these species is not the responsibility of the Plan. The PCAFR will be developed in accordance with the SEPP and the requirements of the associated PPBEMP. To assist in the early detection and eradication of incursions of new marine pests in the waters of PPB, it is important that where suspected such incursions are reported. Fisheries Victoria will develop an aquaculture licence condition requiring licence holders to report the presence of suspected exotic species on commercial aquaculture equipment. In these cases the recommendations of the Interim Victorian Protocol for Managing Exotic Marine Organisms Incursions 1999 (or as updated) will be implemented by the DSE. This Plan describes the management of the PCAFR with emphasis on ESD. The Plan has effect following its declaration by the Minister by notice in the Victoria Government Gazette. Implementation of the Plan will require actions by Government in respect of certain policy matters, by DPI in respect of day-to-day management, and by other stakeholders. The key actions to be undertaken to implement the recommendations of the Plan are listed and numbered below. Note that these tasks are not in priority order. A timetable for the implementation of these key actions is provided in Appendix 9. Many key actions must be completed prior to the allocation of sites, Crown leases or aquaculture licences. The purpose, process, timelines, outputs, outcomes and costs for the implementation of each of the key actions are detailed in Table 6. Note in this Table reference to cost is made on the basis that those key actions that will be implemented within the current Fisheries Victoria budget are referred to as 'within budget costs' (for example no additional funding is required). Where additional funding is required to implement key actions, an estimate of the costs to implement that action is provided. Develop classes of aquaculture licences specific to the PCAFR. Prepare guidelines prescribing detailed methods and standards for undertaking environmental baseline surveys and ongoing monitoring within the PCAFR. Develop Crown lease clauses and aquaculture licence conditions for environmental baseline surveys and ongoing monitoring respectively. Develop a data management system for the storage of environmental baseline survey and ongoing monitoring information. Review/revise capacity for reporting on commercial aquaculture production specifically from the PCAFR. Develop protocols for the management of translocation of live aquatic organisms within, to and from the PCAFR where appropriate. Implement, where appropriate, speed restrictions for boating in the PCAFR. Develop guidelines for surveying of Crown lease sites within the PCAFR. Develop a Crown lease clause and aquaculture licence condition for boundary marking of lease/licence sites within the PCAFR. Mark external boundaries of the PCAFR for navigation purposes, develop a program of regular inspection and maintenance of navigation markers in the PCAFR, and prescribe a levy for the recovery of the associated costs. Develop aquaculture licence conditions prescribing surface infrastructure requirements within the PCAFR. Determine minimum standards for secure attachment of buoys to aquaculture infrastructure and the rehabilitation of lease sites in relation to discarded, derelict and inappropriate aquaculture equipment. Develop and implement a compliance strategy relating to the PCAFR. Develop bond or bank guarantee provisions for cost recovery for the removal of abandoned commercial aquaculture equipment. Develop a Crown lease clause and aquaculture licence condition requiring public liability trespass insurance. Develop an aquaculture licence condition relating to maintenance of environmental standards within the PCAFR. Develop an industry code of practice to facilitate the implementation of the Plan. Review the need for an active cultured stock health surveillance program within the PCAFR. Prepare a research and development action plan and establish a research and development site as required on the basis of strategic needs within the PCFR. Determine the size, location and orientation of Crown lease sites within the PCAFR. Develop Crown lease clauses and aquaculture licence conditions prescribing minimum rates of development within the PCAFR. Extend the existing VSQAP to include the PCAFR. Develop a communication strategy to inform other users about access to the PCAFR. Review the PCAFR Management Plan. 1 Key action Develop classes of aquaculture licences specific to the PCAFR. Tasks * Fisheries Victoria to review legislative mechanisms for prescribing classes of aquaculture licence. * Fisheries Victoria to determine the two classes of aquaculture licences required to manage aquaculture activity within the PCAFR as required by the Plan. * Fisheries Victoria to prescribe classes of aquaculture licence. Timelines Within three months of the declaration of the Plan. Outputs Classes of aquaculture licences specific for the PCAFR. Outcomes Effective management, cost-recovery, reporting, implementation and compliance for the PCAFR. 2 Key action Prepare guidelines prescribing detailed methods and standards for undertaking environmental baseline surveys and ongoing monitoring within the PCAFR. Tasks * Fisheries Victoria to review best practice environmental monitoring and assessment methods, results of the PCAFR characterisation survey, outcomes of expertise based risk assessment and proposed aquaculture activity. * Based on the above, Fisheries Victoria in consultation with relevant agencies will prescribe detailed guidelines for the methods and standards for undertaking environmental baseline surveys and ongoing monitoring. Timelines Prior to the expression of interest process for the PCAFR. Outputs Detailed guidelines for baseline survey and ongoing monitoring methods and standards. Outcomes Comprehensive, scientifically valid and reliable environmental information to support an adaptive, ESD-based management framework. 3 Key action Develop Crown lease clauses and aquaculture licence conditions for environmental baseline surveys and ongoing monitoring respectively. Tasks * Fisheries Victoria to review characterisation surveys, guidelines for environmental baseline surveys and monitoring of Crown lease sites, risk assessment outcomes and proposed aquaculture activity. * Based on the above, DSE in consultation with Fisheries Victoria to prescribe specific Crown lease clauses/aquaculture licence conditions for environmental baseline surveys/ongoing monitoring. Timelines a) Prior to the expression of interest process for Crown lease clauses in respect of environmental baseline surveys. b) Prior to issue of aquaculture licences in respect of ongoing environmental monitoring. Outputs Crown lease and aquaculture licence conditions for environmental baseline surveys and ongoing monitoring. Outcomes Flexible regulatory mechanism to prescribe and facilitate compliance with the environmental management requirements of the Plan. 4 Key action Develop a data management system for the storage of environmental baseline survey and ongoing monitoring information. Tasks * Fisheries Victoria to complete a needs analysis to define and prioritise data management system requirements. * Fisheries Victoria to review available data management systems. * Fisheries Victoria to summarise cost-effective options and make final recommendations on appropriate system, including resource requirements, staging of implementation (where appropriate), and timelines from implementation. * Fisheries Victoria to implement preferred data management system. Timelines Within two years of the declaration of the Plan. Outputs A functional, cost-effective, secure and readily accessible data management system for aquaculture licences, Crown leases and environmental monitoring and assessment information. Outcomes Information-based decision support capacity for ESD-based management of all offshore marine aquaculture fisheries reserves. 5 Key action Review/revise capacity for reporting on commercial aquaculture production specifically from the PCAFR. Tasks * Fisheries Victoria to review existing production reporting process. * Fisheries Victoria, in consultation with industry to determine production reporting requirements. * Based on above, Fisheries Victoria to revise existing process to accommodate specific reporting requirements for the PCAFR. Timelines Within 12 months of the declaration of the Plan. Outputs Reliable, comprehensive and timely reporting of aquaculture production data for the PCAFR. Outcomes Effective and efficient evaluation of relevant socio-economic objectives of the Plan. 6 Key action Develop protocols for the management of translocation of live aquatic organisms within, to and from the PCAFR where appropriate. Tasks * Fisheries Victoria in consultation with relevant agencies to determine the protocols required for the management of translocation of live aquatic organisms within, to and from the FAFR. * Based on the Guidelines for Assessing Translocations of Live Aquatic Organisms in Victoria, Fisheries Victoria to develop detailed protocols for application to aquaculture activity in the FAFR, where appropriate. Outputs Protocols for translocation of live aquatic organisms within, to and from the PCAFR. Outcomes Regulatory mechanism for, and effective management of, threats associated with transmission of disease and biodiversity impacts relating to loss of genetic integrity of endemic species and introduction of exotic species. 7 Key action Implement, where appropriate, speed restrictions for boating in the PCAFR. Tasks * Fisheries Victoria, in consultation with Marine Safety Victoria and Parks Victoria, to identify process for establishing boating speed restrictions within PPB. * Fisheries Victoria, in consultation with Marine Safety Victoria and Parks Victoria, to identify responsibilities for enforcing boating speed limits within the PCAFR. * Fisheries Victoria, in consultation/collaboration with Marine Safety Victoria, Parks Victoria and other appropriate agencies, to implement and enforce boating speed restrictions within the PCAFR where appropriate. Timelines Within six months of the declaration of the Plan. Outputs Appropriate boating speed restriction arrangements in place for PCAFR. Outcomes Safe boating with minimal impact on aquaculture activity within PCAFR. 8 Key action Develop guidelines for surveying of Crown lease sites within the PCAFR. Tasks * Fisheries Victoria to consult Land Registry and Crown Land Management (DSE) on the appropriate methods, standards and reporting for surveying of Crown leases. * Based on the above, Fisheries Victoria to develop guidelines for surveying of Crown leases for marine aquaculture within the PCAFR. Timelines Prior to the issue of Crown leases. Outputs Guidelines for surveying of Crown leases for marine aquaculture within PCAFR. Outcomes Crown lease sites accurately defined and marked within the PCAFR. 9 Key action Develop a Crown lease clause and aquaculture licence condition for boundary marking of lease/licence sites within the PCAFR. Tasks * Fisheries Victoria, in consultation with Parks Victoria, the Victorian Regional Channels Authority and Marine Safety Victoria, to develop standards for the boundary marking of aquaculture sites within the PCAFR. * DSE, in consultation with Fisheries Victoria, to develop an appropriate clause requiring lease holders to mark Crown leases (sites), as specified by Fisheries Victoria at the cost of the lease holder. Timelines Prior to expression of interest process for the PCAFR. Outputs A clause for inclusion on Crown leases specifying boundary marking requirements. Outcomes Safe and orderly access to the PCAFR for boats. 10 Key action Mark external boundaries of the PCAFR for navigation purposes, develop a program of regular inspection and maintenance of navigation markers in the PCAFR, and prescribe a levy for the recovery of the associated costs. Tasks 1. Fisheries Victoria to liaise with the Victorian Regional Channels Authority, Parks Victoria and Marine Safety Victoria regarding type, number and location of navigation marking infrastructure for the PCAFR. 2. Fisheries Victoria following consultation with the FCC and relevant industry representatives on selection of marks to acquire and deploy appropriate navigation marking infrastructure. 3. Fisheries Victoria, in consultation with the Victorian Regional Channels Authority, Parks Victoria and Marine Safety Victoria, to develop an appropriate infrastructure inspection and maintenance program. 4. Fisheries Victoria to implement inspection and maintenance program. 5. Service providers for the inspection and maintenance program to be sourced by a public process. 6. Based on the above, Fisheries Victoria to implement levy for all the PCAFR aquaculture licence holders to recover inspection and maintenance costs to licence holders pro rata on the basis of area licensed. 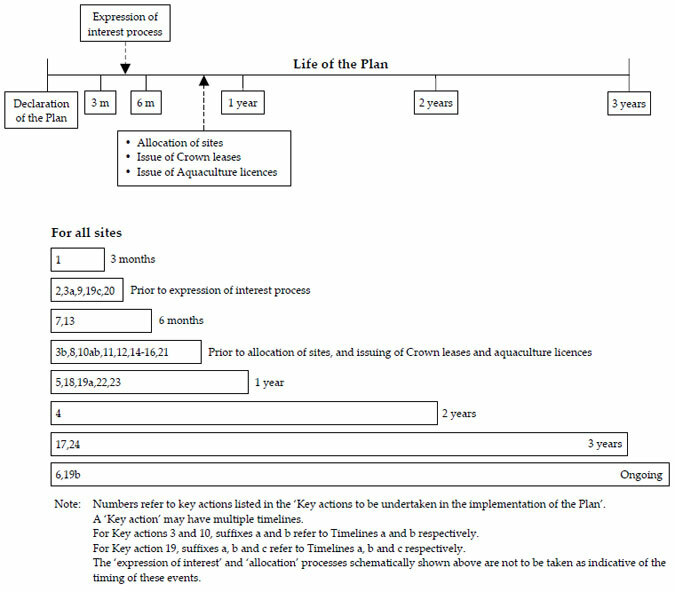 Timelines a) For tasks 1-3, prior to the granting of Crown lease. b) For tasks 4-5, prior to issuing aquaculture licence within the PCAFR. Outputs * Navigation infrastructure in place at the PCAFR, along with associated inspection and maintenance program. * A levy to recover, on behalf of the State Government, all ongoing costs for inspection and maintenance of navigation infrastructure marking the PCAFR. Outcomes A safe and secure demarcation of the PCAFR and recovery of all costs associated with ongoing inspection and maintenance of navigation infrastructure. 11 Key action Develop aquaculture licence conditions prescribing surface infrastructure requirements within the PCAFR. Tasks * Fisheries Victoria, in consultation with relevant industry representatives, to determine requirements for aquaculture licence conditions prescribing surface infrastructure requirements within the PCAFR. * Fisheries Victoria to develop classes of aquaculture licence for PCAFR. * Review proposed aquaculture activity and associated infrastructure needs for the PCAFR. * Draft aquaculture licence conditions consistent with the Plan for visual amenity of surface infrastructure. * Prescribe aquaculture licence condition(s) for infrastructure. Timelines Prior to issuing aquaculture licences within the PCAFR. Outputs Licence conditions managing visual infrastructure deployment to protect visual amenity values. Outcomes Protected visual amenity and enhanced stakeholder satisfaction with PCAFR as a result of reduced/minimal alteration in visual amenity values from aquaculture development within the PCAFR. 12 Key action Determine minimum standards for secure attachment of buoys to aquaculture infrastructure and the rehabilitation of lease sites in relation to discarded, derelict and inappropriate aquaculture equipment. Tasks * Fisheries Victoria, in consultation with relevant industry representatives and Parks Victoria, to determine options for secure attachment and identification of buoys to aquaculture infrastructure. * Fisheries Victoria to develop minimum standards for the attachment and identification of aquaculture production infrastructure. * Fisheries Victoria to develop inspection and maintenance standards of the infrastructure, including documentation and reporting requirements for relevant information on maintenance activities and incidents (for example loss of infrastructure such as buoys). * Fisheries Victoria to prescribe standard conditions for each aquaculture licence issued for the PCAFR. Timelines Prior to issue of aquaculture licences within the PCAFR. Outputs Aquaculture licence conditions outlining identification, security, maintenance and recovery of aquaculture production infrastructure within the PCAFR. Outcomes * Reduced navigation hazards due to lost and or insecure aquaculture infrastructure. * Reduced environmental and visual amenity impacts from aquaculture infrastructure lost from the PCAFR. 13 Key action Develop and implement a compliance strategy relating to the PCAFR. Tasks * Fisheries Victoria to list all relevant aquaculture licence conditions and Crown lease clauses. * Fisheries Victoria to identify all management actions relating to the PCAFR for which there is a compliance requirement. * Fisheries Victoria to identify all other stakeholders with compliance responsibilities within the PCAFR. * Fisheries Victoria to identify compliance techniques relating to previously listed actions. * Fisheries Victoria, in consultation with identified stakeholders, develop and implement the compliance strategy. Outputs Development and implementation of a compliance strategy which includes needs of the PCAFR. Outcomes * An appropriate level of compliance with management actions for the PCAFR. * Effective implementation of the Plan. 14 Key action Develop bond or bank guarantee provisions for cost recovery for the removal of abandoned commercial aquaculture equipment. Tasks * Fisheries Victoria, in consultation with relevant industry representatives, to determine the preferred mechanism, either bonds or bank guarantee. * DSE in consultation with Fisheries Victoria to develop a Crown lease clause requiring the lease holder to provide a legally enforceable bond or bank guarantee (Consumer Price Index adjusted and reviewed with the Plan). Timelines Prior to granting Crown leases. Outputs A clause prescribing a bond or bank guarantee relating to the removal of abandoned infrastructure. Outcomes Maintenance of environmental standards and navigation safety in terms of the removal of abandoned infrastructure. 15 Key action Develop a Crown lease clause and aquaculture licence condition requiring public liability trespass insurance. Tasks * Fisheries Victoria to identify the public liability risks to which the State of Victoria is exposed through implementation of the Plan. * Based on the above, Fisheries Victoria to identify the requirements for public liability insurance to indemnify the State of Victoria against financial loss. * Fisheries Victoria to develop Crown lease clause requiring the Crown lease holder to obtain relevant public liability insurance indemnifying the State of Victoria. Outputs All Crown lease holders are adequately insured against trespass. Outcomes Reduced financial risk to State of Victoria. 16 Key action Develop an aquaculture licence condition relating to maintenance of environmental standards within the PCAFR. Actions * Fisheries Victoria to identify the provisions of the Plan in relation to environmental standards and the associated performance indicators, management triggers and remedial actions. * Fisheries Victoria to develop aquaculture licence conditions requiring the appropriate management actions to be undertaken by, and at the cost of, the aquaculture licence holder in the event of an environmental standard being breached. Timelines Prior to granting aquaculture licences. Outputs Establishment of arrangements for the appropriate remediation responses for Crown lease/aquaculture licence sites within the PCAFR. Outcomes Maintenance of environmental standards within the PCAFR. 17 Key action Develop an industry code of practice to facilitate the implementation of the Plan. Tasks * FCC in consultation with relevant industry representatives to identify issues to be resolved through the development and implementation of an industry code of practice, including noise and lighting, waste and other aspects of environmental management. * FCC to prioritise development of code of practice, develop an implementation plan and identify/acquire appropriate resources. * FCC to action implementation plan for code of practice. Timelines Within the life of the plan. Outputs Code of practice facilitating the implementation of the Plan. Outcomes Industry self-regulation of certain issues associated with the management of the PCAFR. Tasks * Fisheries Victoria and the Office of the Chief Veterinary Officer to identify the requirements for an active cultured stock health surveillance program for the PCAFR. * Fisheries Victoria and the Office of the Chief Veterinary Officer to outline the requirements, benefits and costs to industry of an active cultured stock health surveillance program within the PCAFR. * Industry and government to decide on cost-effectiveness of implementing an active disease surveillance program. Outputs Dependent upon industry and government decision regarding the need for active surveillance program. 19 Key action Prepare a research and development action plan and establish a research and development site as required on the basis of strategic needs within the PCAFR. Tasks * Fisheries Victoria, relevant industry representatives and PIRVic to review sectoral, state and national research, and development strategies relevant to marine aquaculture in Victoria and the PCAFR. * Fisheries Victoria, relevant industry representatives and PIRVic to identify a process for the preparation/ prioritisation and annual review of three year research and development action plan that recognises both strategic and applied research needs. * Fisheries Victoria, relevant industry representatives and PIRVic to prepare a three year research and development action plan for marine aquaculture fisheries reserves that recognises both strategic and applied research needs in the PCAFR. * Fisheries Victoria, relevant industry representatives and PIRVic to identify and establish an appropriate site for undertaking research and development on behalf of the Secretary, DPI, within the Reserves as required on the basis of strategic research and development needs within the PCAFR. Timelines a) Complete the action plan within 12 months of the declaration of the Plan. b) Any research and development action plan to be annually reviewed. c) Establish a research and development site, if required, during the design of the PCAFR. Outputs * Three year research and development action plan for the PCAFR. * A research and development site, if required. Outcomes Timely, relevant and cost-effective research and development within the PCAFR. 20 Key action Determine the size, location and orientation of Crown lease sites within the PCAFR. Tasks * Fisheries Victoria to determine the factors to be considered in the design of the Crown lease sites within the PCAFR including: economic viability, separation distances for access, buffer zones and water flows and carrying capacity. * Fisheries Victoria to determine option(s) for Crown lease sizes, orientation, location and aquaculture activity. * Fisheries Victoria to consult with the FCC and relevant industry representatives on options for the design of sites within the PCAFR. * Fisheries Victoria to finalise the design of Crown lease sites within the PCAFR. Outputs ESD compliant design of Crown lease sites within the PCAFR. Outcomes Optimal aquaculture development of the PCAFR within an ESD framework. 21 Key action Develop Crown lease clauses and aquaculture licence conditions prescribing minimum rates of development within the PCAFR. Tasks * Fisheries Victoria to develop an aquaculture licence condition for minimum rates of development on a case by case basis relevant to the proposed aquaculture activity within the PCAFR, including development plan submitted by proponent. * Based on the above, Fisheries Victoria, in consultation with DSE, to develop a Crown lease clause as required. Outputs Crown lease clauses and aquaculture licence conditions specifying minimum rates of development. Outcomes Optimal aquaculture development of the PCAFR within ESD framework. 22 Key action Extend the existing VSQAP to include the PCAFR. Tasks * The State Shellfish Control Agency to determine monitoring and sanitary survey requirements for the PCAFR to be compliant with the ASQAP Operations Manual (2002). * The State Shellfish Control Agency to design and cost a monitoring and sanitary survey program for the PCAFR to meet ASQAP requirements. * The State Shellfish Control Agency to implement sanitary survey and monitoring program for the PCAFR, subject to funding arrangements. Outputs Water and product quality monitoring for the PCAFR. Outcomes Quality assured aquaculture bivalve shellfish product. 23 Key action Develop a communication strategy to inform other users about access to the PCAFR. Tasks * Fisheries Victoria to identify other users, key information requirements, effective means of information distribution and processes for updating information packages. * Fisheries Victoria to prepare a communication strategy in consultation with other users, relevant industry representatives and VRFish. * Fisheries Victoria to implement communication strategy. Outputs * A communication strategy for the PCAFR. * Information relevant to the PCAFR via Internet sites, literature etc. 24 Key action Review the PCAFR Management Plan. Tasks * Fisheries Victoria to undertake environmental assessment of the reference sites to allow comparison with the baseline survey. * Fisheries Victoria to review the performance of the Plan against the performance indicators and reference points of the Plan. * Fisheries Victoria to identify relevant stakeholders. * Fisheries Victoria to establish a steering committee to review the Plan and implement the review process. Timelines Commence at month 30 of the Plan to be completed prior to the end of the life of the Plan. Outputs Review of the Plan. Outcomes Basis for the drafting of the new Plan. Cost * Survey costs yet to be defined. * Review (including steering committee costs) within program costs. AFFA (2001) Aquaplan Control Centre Manual. ANZECC and ARMCANZ (2000) Australian Guidelines for Water Quality Monitoring and Reporting - Summary 2000. AS/NZS 4360:1999 Australian/New Zealand Standard for Risk Management. ASQAAC (2002) Australian Shellfish Quality Assurance Program Operations Manual. Barry, J. M., and Bailey, M. (2001) Bathymetric survey of the proposed aquaculture zone, Pinnace Channel, Port Phillip. MAFRI Report No. 35. Cohen, B.F., Currie, D.R. and McArthur, M.A. (2000) Epibenthic community structure in Port Phillip Bay, Victoria, Australia. Marine and Freshwater Research 51: 689-702. Coleman, N., Longmore, A, and Cohen, B. (2001) Baseline data for the Pinnace Channel aquaculture site. MAFRI Report No. 34. Currie and Parry (1999) Changes to benthic communities over 20 years in Port Phillip Bay, Victoria, Australia. Marine Pollution Bulletin 38(1): 36-43. EC C (1998) Marine Coastal and Estuarine Investigation - Interim Report. EC C (2000) Marine Coastal and Estuarine Investigation - Final Report. ENRC (2000) Inquiry into Utilisation of Victorian Native Flora and Fauna - Report. FCC (2001) Research Needs and Priorities for Fisheries in Victoria 2001/02 - 2005/06. Gavine, F. and McKinnon, L. (2002) Environmental monitoring of marine aquaculture in Victorian coastal waters: a review of appropriate methods. MAFRI Report No. 46. McKinnon, L.J., Parry, G.D., Leporati, S., Heislers, G.F., Werner, G.F., Gason, A.S.H., Fabris, G., and O'Mahoney, N. (2003) The environmental effects of blue mussels (Mytilus edulis) aquaculture in Port Phillip Bay. Fisheries Victoria Research Report Series No. 1. OIE (2004) International Aquatic Animal Health Code. Poore, S.F. (1992) Soft-bottom macrobenthos of Port Phillip Bay: a literature review. CSIRO, Port Phillip Bay Environmental Study Technical Report No. 2. Australian National Marine Biotoxin Strategy Draft, November 2001, Cawthron Report No 645. Fisheries Victoria of the Department of Primary Industries will be responsible for the preparation of the Fisheries Reserve Management Plan. The plan must be consistent with the objectives of the Fisheries Act 1995. The Fisheries Co-Management Council will oversee the process for the preparation of the Fisheries Reserve Management Plan, in consultation with the Aquaculture Fisheries Committee. The plan must comply with Part 3 of the Fisheries Act 1995, in particular sections 28(6), 30, 32 and 35 of the Act. The Fisheries Reserve Management Plan shall be prepared with input from all major affected stakeholder groups including Fisheries Victoria, aquaculture interests, conservation interests, recreational fishing interests and commercial fishing interests. The Fisheries Reserve Management Plan shall be consistent with the Victorian Government Response (2001) to the recommendations for marine aquaculture of the Environment Conservation Council in the final report of their Marine Coastal and Estuarine Investigation 2000. The Fisheries Reserve Management Plan shall specify appropriate management controls with regard to commercial aquaculture equipment including visual amenity, identification, security and maintenance. The Fisheries Reserve Management Plan shall specify areas available for allocation within the reserve and also public access to the reserve. The Fisheries Reserve Management Plan shall specify the requirements and responsibilities for navigation marking of the reserve and the navigation marking and survey of aquaculture sites allocated within the reserve. The Fisheries Reserve Management Plan shall specify the requirements for holding Crown leases and criteria for the transfer, amalgamation, subdivision and subleasing within the fisheries reserve. The Fisheries Reserve Management Plan shall specify the requirements for environmental monitoring of aquaculture operations by licence holders in the reserve. It will also determine processes for auditing of and reporting to the Victorian community on the outcomes of environmental monitoring relating to the reserve. The Fisheries Reserve Management Plan shall specify the requirements of licence holders with regard to product quality assurance programs. The culture of abalone contained in mid-water and or movable cages located on the seafloor. The non-contained culture of abalone on structures. The use of harvested macroalgae and or artificial feeds in aquaculture. A process culminating in the issue of Crown leases over areas within an aquaculture fisheries reserve consistent with the Victorian Aquaculture fisheries reserves - leasing and licensing policy. Feeds including pelleted formulated feeds, whole/trash fish and by-products used for aquaculture. An initial assessment of physico-chemical, environmental and biological attributes of the specific Crown lease site. Compliance points which are located outside the Crown lease/aquaculture licence site at a predetermined location and designed to be used as 'indicators' to clarify the extent of environmental impacts attributable to aquaculture activity within the Crown lease/aquaculture licence site. A broad assessment of the habitat, physicochemical, environmental and biological attributes of new aquaculture areas, including extensions to existing areas. An aquaculture fisheries reserve design in which the reserve is divided into equal sized square blocks (sites) and every alternate block is utilised for aquaculture, similar to the pattern on a checkerboard. Those specific locations within the Crown lease/aquaculture licence site at which survey data and or samples will be measured/collected, typically along a specific transect. Biological Reference Sites are effectively compliance points which are located outside the lease/licence site at a predetermined location and designed to be used as 'indicators' to clarify the extent of environmental impacts attributable to aquaculture activity within the Crown lease/aquaculture licence site. The area of land specified on a Crown lease issued under the Land Act 1958. A management plan may be declared by the Minister under section 28(1) of the Fisheries Act 1995. An area set aside for the placement of sediment removed from commercial shipping channels by dredging. A term used to describe development that takes account of environmental sustainability, economic viability and social equity. Animals that live on the sea floor, or attached to other animals or objects under water. Leave area uncultivated or move aquaculture cage to another area. The amount of food required to produce a certain amount of wet weight in an aquaculture species. Also expressed as a ratio. An area not previously developed. Animals that live beneath the surface of the sea floor. The area specified on an aquaculture licence issued under section 43 of the Fisheries Act 1995, within which aquaculture activity is authorised. A person whose name is entered on the Register of Licensed Surveyors as per the Surveying Act 2004. The length of longline that is available for the attachment of production substrate. The status that is unacceptable and requires immediate remedial action. Refers to ongoing assessment of physico-chemical, environmental and biological attributes of the aquaculture licence site(s). A mechanism established through 'nutrient trading' whereby the addition of nutrients from one operation is offset by the removal of nutrients by another operation. Quantities to be measured in order to track the status of the PCAFR relevant to the objectives. An action undertaken to return the status to the target reference point. The status management wishes to achieve. The aquaculture species specified in an Aquaculture Licence for culture. Stocking density includes both the number and biomass of a stocked species within a unit area or volume expressed as an average over one year. Under the EPBC Act, threatened species are listed under the following categories: Extinct; Extinct in the Wild; Critically Endangered; Endangered; Vulnerable; Lower Risk; or Data Deficient. Any human assisted movement of an aquatic organism. a detailed monitoring program, including monitoring of the ongoing net nutrient balance, is carried out by the Department of Natural Resources and Environment. a mechanism is developed, and put in place, to ensure independent monitoring of the ongoing net nutrient balance of commercial finfish aquaculture operations in the bay. Schedule F6 (Waters of Port Phillip Bay) of the State environment protection policy (Waters of Victoria) requires the annual nitrogen load to Port Phillip Bay to be reduced by 1000 tonnes by 2006, and development of a Port Phillip Bay Environmental Management Plan and associated Nutrient Reduction Plan. Any finfish aquaculture proposals will be required to conform to the Nutrient Reduction Plan. Within this context, the application of nutrient offset mechanisms (through the establishment of 'nutrient trading' whereby the addition of nutrients from one operation is offset by the removal of nutrients by another operation) will be investigated. In addition, as nitrogen is the key limiting nutrient for biological processes in the Bay, the focus of any offsetting/trading will be on nitrogen rather than other nutrients, such as phosphorus. Under any offset/trading scheme, purchasers of offsets will need to ensure best practice approaches are used to minimise nutrient inputs. Commercial finfish aquaculture in Port Phillip Bay will only be considered if it can be demonstrated through peer-reviewed scientific research that nutrient management can be implemented successfully and without detriment to the environmental values of the Bay. During the current review of the State environment protection policy (Waters of Victoria), EPA will consider including specific provisions in relation to waste minimisation requirements of aquaculture. any additional requirements for individual areas noted in recommendations E1 to E12 below. It is proposed that aquaculture zones be declared as fisheries reserves under Section 88 of the Fisheries Act 1995. As prescribed by Section 89 of the Act, a Management Plan must be prepared. The purpose of a Management Plan is to specify policies and strategies to ensure the ecological sustainable development of aquaculture zones. Accordingly the Management Plan will specify commitments to monitoring, public access, structural compliance and other requirements listed above (see R46). Until the completion and approval of a Victorian Translocation Policy consistent with the National Policy for the Translocation of Live Aquatic Organisms, (Ministerial Council on Forestry, Fisheries and Aquaculture 1999), translocation of marine organisms for aquaculture be conducted according to interim translocation protocols or codes of practice, which should be publicly available. Preparation of the State policy and associated codes of practice should include public consultation. NRE is developing a Victorian Translocation Policy, which will be released for public comment. In the interim, as a minimum standard NRE will continue to comply with the National Policy for the Translocation of Live Aquatic Organisms regarding translocation of marine organisms for aquaculture. Such detail will be outlined in the Management Plans for aquaculture zones, which will be released for public comment. The Management Plan will also give consideration to the indicators mentioned above, amongst others, and specify the frequency of public reporting. Aquaculture operations which use supplementary food ensure that the food is tested and certified to be free from diseases, pathogens, other unwanted species, and therapeutic chemicals, subject to Import Risk Analyses (IRAs) to be developed by AQIS for processed aquatic animal feeds, aquatic meals and other aquatic animal products (see AQIS 1997). Monitoring of imported product is the responsibility of Biosecurity Australia (formerly part of the Australian Quarantine and Inspection Service). Aquaculture operators will only be able to use imported product approved by Biosecurity Australia. Conditions of aquaculture licences include provision for an instrument such as a performance bond to ensure that the operator undertake restoration of the site should the operation be abandoned or destroyed. Recent changes to the Fisheries Act 1995 provide specific provision for the Secretary of NRE to require the clean-up of a site by the licence holder if that licence is cancelled or expired. This provision extends to the licence holder covering the costs associated with restoration of abandoned or destroyed aquaculture sites. Other uses within licenced sites be allowed, except where they affect safe, secure and efficient aquaculture operations. Aquaculture leases in zones are comparable to terrestrial commercial businesses. Public health and safety (ropes, surface obstructions, traffic etc. ), operational efficiency and stock security are issues to consider when looking at multiple-use of these sites. In general, public access to aquaculture zones will be permitted but not to any declared lease areas. The Government will support aquaculture initiatives subject to environmental assessment in each case. Existing and future marine aquaculture will be assessed under a management planning process, where planning and environmental controls will be established following community consultation. Aquaculture initiative funds over the last two years were aimed at facilitating industry growth. A review of the aquaculture initiative has recently been completed and endorsed by the Minister for Energy and Resources and will guide future Government commitment to aquaculture development. All proposed aquaculture zones in Port Phillip Bay will be developed in accordance with Schedule F6 (Waters of Port Phillip Bay) of the State environment protection policy (Waters of Victoria). 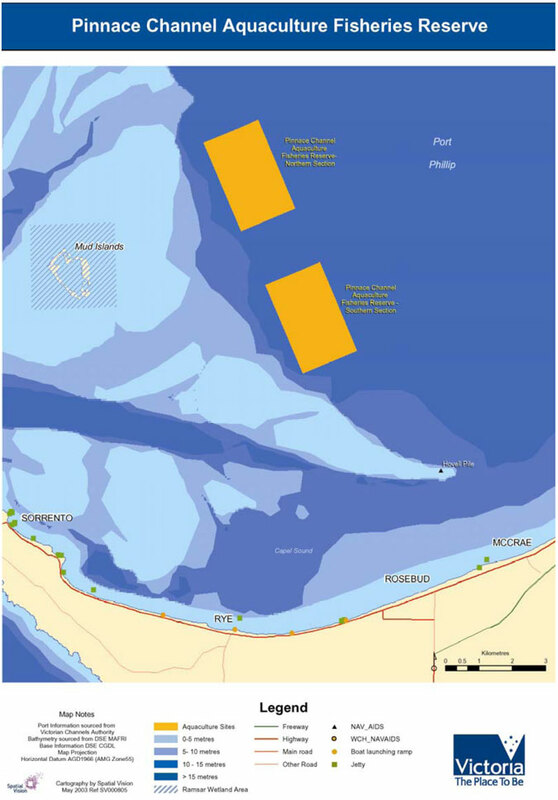 The Kirk Point-Werribee Aquaculture Zone is located near the Western Treatment Plant. Any aquaculture proposal will need to be developed in accordance with requirements specified in the Werribee Segment of Schedule F6 (Waters of Port Phillip Bay) of the State environment protection policy (Waters of Victoria). The physico-chemical and biological features of the PCAFR have been assessed and described by the Marine and Freshwater Resources Institute and the ECC as part of characterisation studies of the area (ECC 1998, Barry and Bailey 2001; Coleman et al. 2001)11. The following description is a synopsis of this information. The PCAFR is comprised of two blocks located on either side of the Pinnace Channel where it flows from the Great Sands area (see Figure 1). The sites are referred to as the northern and southern blocks and the coordinates are as follows. Both blocks have water that ranges from 15 to more than 20 m in depth (see Figure 2). The northern block comprises around 80 per cent of water at depths greater than 20 m. The southern block comprises around 20 per cent of water at depths greater than 20 m. The deepest area within either site is around 24 m.
In the characterisation survey a total of 20 randomly allocated sites were analysed. The sediment is predominantly of very fine sand (0.06 to 0.125 mm) with some areas of fine sand (0.125 to 0.25 mm). The mud content of the sediment ranges from approximately 8 to 40%. Sediment characteristics are related to depth, with grain size decreasing and mud content increasing as depth increases. Sandy, shallower areas at depth less than 20 m displayed a bedform dominated by mounds and depressions caused by Callianassid shrimps, while the muddy sediments of depth greater than 20 m displayed a flat profile (Coleman et al. 2001). Sediment carbon content ranged from 1.4 to 5.6%, with carbon content decreasing with depth. Sediment nitrogen content ranged from 0.06 to 0.19%, and tended to increase with depth. The benthic fauna of PPB is rich in species diversity compared to similar embayments in other parts of the world. Although highly diverse, many species are scattered or infrequent in occurrence appearing at only a few sites (Poore 1992). The benthic fauna of PCAFR conforms to this general pattern with many species represented by relatively few individuals occurring at one or two sites. The characterisation survey identified 137 species, with the number of species per site ranging from 16 to 50 when benthic grab samples were passed through a 1 mm sieve. The number of individual specimens per site ranged from 54 to 519. The species diversity described approximates that of the 'intermediate sediments' as defined by Currie and Parry (1999). Polychaetes worms most dominated benthic fauna accounting for over 45% of the individuals sampled with Lumbrineris cf laterilli, Marphysa sp, Nephtys inornata and Maldanid sp contributing 29%, 9%, 5% and 2% of the total individuals sampled respectfully. Other relatively abundant species were the crustacean Kalliapseudes sp (5% of individuals sampled) and the bivalves Chioneryx cardiodes (5% of individuals sampled) and Corbula gibba (an exotic bivalve, 2% of individuals sampled). The majority of the species were uncommon, with 92 species represented by less than 10 individuals and 69 species occurring at only one or two sampling sites. Species diversity and density varied with depth, with greater species diversity and numbers of individuals at sampling sites at a depth 20 m or less (39 and 320 respectively) than at sampling sites greater than 20 m (25 and 110 respectively). Sites at greater than 20 m depth were also characterised by a more even distribution of individuals amongst species. However, evenness was relatively high for all sampling sites, 0.55 to 0.86, allowing for the detection of opportunistic species associated with altered ecological conditions. Visual analysis identified occasional sparse Caulerpa sp beds along with beds of unidentified red alga, at depth 20 m or less. The depressions caused by Callianassid shrimps collected large quantities of drift algae, and when drift algae was absent, these depressions contained large quantities of broken shell rubble. Microalgal mats were not observed within the PCAFR. Epifaunal diversity and abundance was low, with fourteen species identified in six video transects covering approximately 5.5 km of the seafloor. Previously only 20 species were recorded by divers within the area now defined as PCAFR (Cohen et al., 2000). Those species identified by divers, but not identified by video footage, are small and or cryptic and would be not easily detected by video. Abundance of epifauna was generally low with less than 10 individuals per 100m, with the exception of the ascidian Pyura stalonifera on sediments in 20m or less of water. The ascidian Pyura stalonifera was the most common species, followed by the native flat oyster, the ascidian Cnemidocarpa etheridgii and the scallop. The abundance of many species varied between the shallow, sandy sediments (20m or less) and the deeper, muddy sediments (greater than 20m). The sandy sediments supported more of the ascidian Pyura stalonifera. The muddier sediments supported more sea cucumbers Stichopus mollis and scallop. The predominant water currents are generated by tidal flushes that peak during ebb and flood tides12. Current directions are likely to be from the northnorth-east (flood tide) and the south-south-west (ebb tide). The area closer to the northern bank of the Great Sands may produce local current disturbances of variable direction and speed. Both blocks are subject to daily tidal flushing that is likely to generate considerable mixing and exchange. On the flood tide waters flow in from Bass Strait, while on the ebb tide waters flow from the deeper, central PPB area. The regular flushing of southern PPB should ensure water quality within the PCAFR is maintained at a standard suitable for aquaculture. A current meter was deployed at each block of PCAFR from mid December 2002 to mid February 2003. At the northern block, ebb and flood current speeds were broadly similar at about 0.10 to 0.15 m/s but occasionally peaked at 0.25 m/s. Peaks in current speed may be the result of intense weather events. The flood current direction was fairly stable at about north to north-north-east. The ebb current direction varied between west to northwest, that is towards Symonds Channel, and south-west to south-south-west, that is towards the Pinnace Channel. At the southern block, peak ebb and flood speeds were again similar but somewhat higher than the northern site, generally 0.10 to 0.25 m/s. Flood current direction was again more stable and mainly between north-north-east and northeast, while ebb current directions varied mainly between west and west-south-west. The most predominant direction for winds in southern PPB speeds is southerly which occurs 21% of the time followed by westerly at 15% of the time and northerly 14% of the time12. For winds greater than 30 km/h, the prevailing direction was southerly (7.6%) followed by westerly (7.4%), then south-westerly (6.3%) and northerly (6%). The most common wind speed range was 20 - 30 km/h (34%) followed by the 30 - 40 km/h (21%) and 11 - 20 km/h (20%). Winds greater than 40 km/h occurred 16.7% of the time and winds 10 km/h or less occurred 7.0% of the time. Wave heights at PCAFR were estimated using a wave generation model based on fetch lengths within PPB and historical wind data12. Using this model it was estimated the Northern Block experienced waves between 0.5 and 1.0 m 46.9% of the time and waves greater than 1.0 m 7.9% of the time. At the Southern Block waves between 0.5 and 1.0 m occurred 39.5% while waves greater than 1.0 m height occurred 7.8% of the time. The highest waves came predominantly from the north quadrant, primarily a result of this quadrant having the greatest fetch length (approximately 30 km). In addition, some of the strongest winds affecting PPB are from this quadrant. These data are consistent with the wave climate data compiled for the VRCA in 1974/5 from the nearby Rosebud area of PPB which has a similar fetch length. These data showed a worst case scenario in that year of a maximum wave height of 1.6 m with a period of 4.5 seconds. It is worth noting that waves in excess of 1 m were recorded less than 5% of the time. Water quality within the PCAFR is important to provide an environment to promote the growth of the target species and to ensure harvested stock are suitable for human consumption. Water quality parameters for growth include temperature, salinity and primary productivity. Temperature were recorded at the site from August 2000 to February 2003 and ranged from 9.9 to 22.1°C. Between August 2000 and August 2001 temperature data was available from both the PCAFR and the Western Channel marker. There was an excellent correlation between the two data sets. The ten year data set from the Western Channel marker indicates that temperatures in the PCAFR are likely to be predominantly between 10 and 22°C. There are no salinity data available for the PCAFR, however salinity data at a depth of 3 m is available from the Western Channel marker (near Symonds Channel). Salinity at this site varied from 30.4 to 35.5 parts per thousand over an 8 year period. The concentration of phytoplankton in the waters of the PCAFR is important for the growth of filter feeding bivalve shellfish. The southern end of PPB generally has lower levels of chlorophyll a reflecting a lower concentration of phytoplankton for the area, however good currents in the region may assist nutrient availability to shellfish. Water quality parameters that impact upon the production of shellfish for human consumption include microbiological contamination and algal blooms. Faecal coliforms of mammalian origin pose a threat to shellfish quality generally when flushed from terrestrial sources into shellfish harvesting areas. There has been very little bacterial sampling in the vicinity of the PCAFR. Based on strong daily tidal exchanges and other findings in the south of PPB (for example Capel Sound) there is little risk of contamination by faecal coliforms from land based sources within the PCAFR. Given the lack of sampling in the PCAFR, potential impacts from the Mud Islands require further investigation. The high flushing rates and high exchange with Bass Strait water is considered to also decrease the risk of algal blooms within the PCAFR. As a result the PCAFR is consider to be a low risk site with regard to algal blooms and in particular the 'bitter taste' blooms that have a serious impact on mussel farming in other areas of PPB. The VSQAP will monitor the phytoplankton species at the PCAFR for the presence of any problem/nuisance species and appropriate management will be implemented to protect human health and product quality. 1 A licence site is the area specified on an aquaculture licence issued under section 43 of the Fisheries Act within which aquaculture activity is authorised. 2 Cage culture includes the culture of abalone contained in cages suspended in mid-water and or movable cages located on the seafloor. 3 Abalone ranching is the non-contained culture of abalone on structures. 4 Note that NRE (Department of Natural Resources and Environment) is now the Department of Primary Industries and the Department of Sustainability and Environment. 5 Wave, current and temperature data for the Pinnace Channel Aquaculture Fisheries Reserve are available at www.depi.vic.gov.au. 6 Compliance points are those specific locations within Crown lease/aquaculture licence sites at which survey data and or samples will be measured/collected, typically along a specific transect. Reference sites are effectively compliance points which are located outside the lease/licence site at a predetermined location and designed to be used as 'controls' to clarify the extent of environmental impacts attributable to aquaculture activity within the Crown lease/aquaculture licence site. 7 'Artificial Feeds' includes pelleted formulated feeds, whole/trash fish and by-products used for aquaculture purposes. 8 Nutrient offset mechanisms may be established whereby the addition of nutrients from one operation is offset by the removal of nutrients by another operation. 10 'Longline backbone' is the length of longline backbone (headline) that is available for the attachment of production substrate. No differentiation will be made between the length of single or double backbone longline. 11 Wave, current and temperature data for the Pinnace Channel Aquaculture Fisheries Reserves are available at www.depi.vic.gov.au. 12 Wave, current and temperature data for the Pinnace Channel Aquaculture Fisheries Reserves are available at www.depi.vic.gov.au.